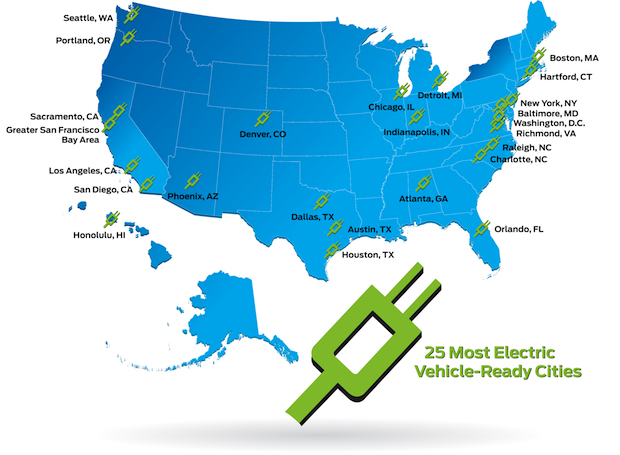 A new ranking of cities’ electric car infrastructures shows that EVs might be a blue state kind of ride. Ford–which is about to release an all-electric version of the Focus–just put out the above map of the United States with the cities it feels are best suited to electric car ownership. And with a few exceptions, it looks like the flyover states aren’t making preparations for the messianic arrival of the electric car. What do you want to bet that in the next presidential election, we’ll add “electric-car” to the litany of liberal-associative words like arugula, lattes, and sushi. Tinskey says that cities that ranked high on their list did so by making it easier to obtain permits for home charging stations, working with utility companies to set up cheaper rates during the night (when people will charge), and using an “urban planning approach to public charge station locations–meaning that they look at traffic flows and where people spend their parked time to determine charging locations.” All of which means that the government needs to interfere in our lives a little more to make electric cars a feasible reality. Note: Yes, indeed. Atlanta is in Georgia, not Alabama. We’ll take it up with Ford, it’s their map.